The 2005–06 Scottish Premier League was won by Celtic, with a 17-point margin over their nearest challengers Hearts in the first season under the management of Gordon Strachan. Rangers, who finished third, failed to finish a Scottish top flight campaign as champions or runners-up for the first time since 1988. As league champions, Celtic qualified for the UEFA Champions League, with runners-up Hearts also qualifying. This marked the first time since 1995 that a club outside the Old Firm of Celtic and Rangers finished in the top two. 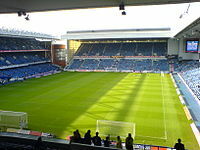 Third-placed Rangers qualified for the UEFA Cup, as did Scottish Second Division champions Gretna, who took the Scottish Cup place despite losing the final to Hearts. Livingston were relegated, and Scottish First Division winners St Mirren were promoted. Kris Boyd was the top scorer with 32 goals (17 for Rangers after 15 for Kilmarnock). ^ Teams played each other three times (33 matches), before the league split into two groups (the top six and the bottom six) for the last five matches. ^ Hibernian qualified for the 2006 UEFA Intertoto Cup by being the highest place applicant for the competition. During matches 23–33 each team played every other team once (either at home or away). During matches 34–38 each team played every other team in their half of the table once. ^ "Aberdeen Football Club". Scottish Professional Football League. Retrieved 11 November 2013. ^ "Dundee United Football Club". Scottish Professional Football League. Retrieved 11 November 2013. ^ "Falkirk Football Club". Scottish Professional Football League. Retrieved 11 November 2013. ^ "Dunfermline Athletic Football Club". Scottish Professional Football League. Retrieved 11 November 2013. ^ "Heart of Midlothian Football Club". Scottish Professional Football League. Archived from the original on 22 October 2013. Retrieved 11 November 2013. ^ "Hibernian Football Club". Scottish Professional Football League. Retrieved 11 November 2013. ^ "Kilmarnock Football Club". Scottish Professional Football League. Retrieved 11 November 2013. ^ "Livingston Football Club". Scottish Professional Football League. Retrieved 11 November 2013. ^ "Motherwell Football Club". Scottish Professional Football League. Retrieved 11 November 2013. ^ "Rangers Football Club". Scottish Professional Football League. Retrieved 4 November 2015. This page was last edited on 7 April 2019, at 09:33 (UTC).